GPU-Z v2.12.0 has been released by TechPowerUp. As reported by the site that hosts the utility it includes a number of useful features plus some stability updates. Chief among the major new features is the flagging up of fake Nvidia graphics cards. Probably the second most important feature update allows users of the new GeForce RTX 20 series of graphics cards to extract and upload their BIOS file(s). Fake graphics cards are a blight on the market, and yet another pitfall that PC gamers and enthusiasts have to avoid when searching for a new GPU, especially if bargain hunting. I’ve not had my hands on a fake GPU before, luckily, but I’ve seen a few analysed on YouTube tech channels. 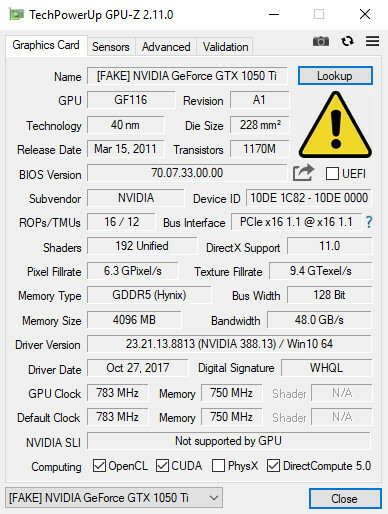 As TPU points out, the latest versions of GPU-Z not only detects existing fakes but should be able “to detect a fake RTX 2060, which in reality uses a GK106 GPU.” If you do happen to install a fake GPU on your system and open up the new GPU-Z you can quickly see that it is dodgy via the large yellow exclamation mark sign on the main info tab, as well as the 'FAKE' prefix added to the name field. If you have one of the new GeForce RTX 20 series of graphics cards the latest GPU-Z will enable you to extract and upload graphics card BIOS. Such backups could help you out after some kind of ‘accident’ and could be helpful to the community too. 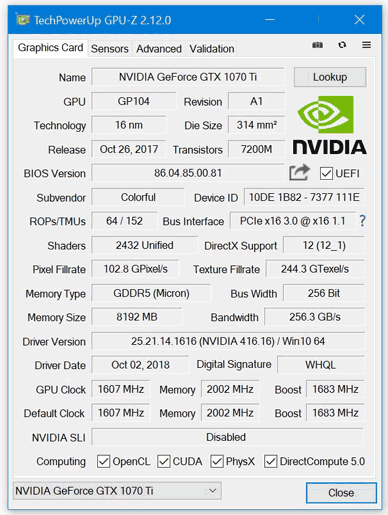 Yet another update for Nvidia Turing GPU owners comes in the form of greater logging info from cards with multiple independent fans. Now the utility will log each individual fan in RPM and fan speed percentage. Nvidia card power draw is now reported both as a percentage of TDP and as an absolute value in Watts. One further feature is that in the advanced tab of the utility you can now see information about your HDMI and DisplayPort connectors. Numerous bug fixes have been applied in this release too. For example the developers have fixed a system hang due to a conflict with Valve's VAC system. For the full release notes and changelog, head on over to the download page. At the same location you can choose to download the regular or Asus ROG version too (approx 5.8MB). i presume the ‘lookip’ button will send of details to check its details, thereby always checking against the latest dataset? “minimize on close” is enabled.